Status: Active. BCGS Cemetery Records updated August 2009. Curtis Cemetery is recorded in the Berrien County land records as the Smith Cemetery and for a time there was a sign reading Smith/Curtis Cemetery. Today the sign reads Curtis Cemetery and is nestled in a small group of trees in front of APL Logistics. 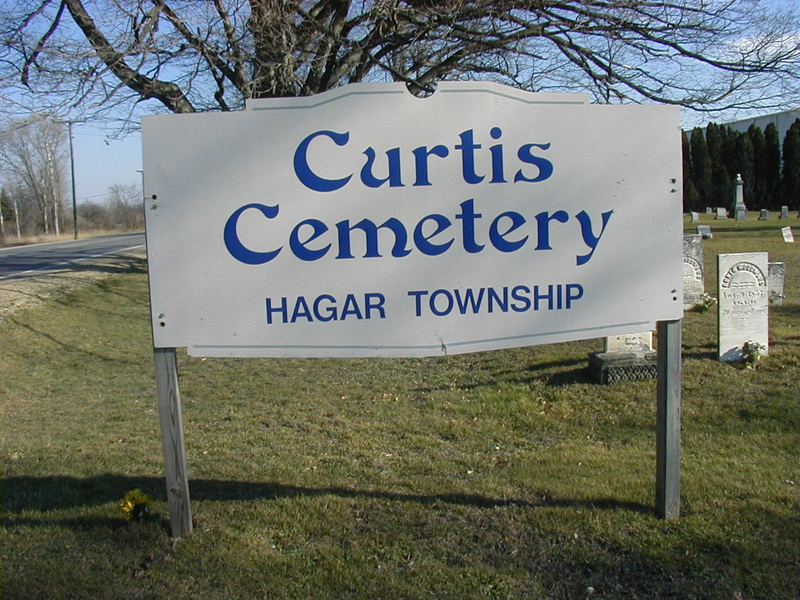 Originally on the property of Michigan Fruit Canners, they deeded the cemetery to Hagar Township on May 6, 1965. The first burial that could be found was William M. Smith who was born on December 13, 1838 and died on May 18, 1841. Many apparent gravesites are unmarked. In September of 1980, members of the Berrien County Genealogical Society transcribed the headstones in Curtis Cemetery and found 122 stones that were readable. Unfortunately, a fire destroyed most of the sexton records in the 1950’s so they have had to be recreated. During the 1980 walkthrough, the last burial was that of Lizzie B. Arent, who died in 1973.